What if a work of science fiction became the jumping-off point for explorative and interactive learning and engagement? And what if that same story could engage readers in a wide range of other subjects, becoming a platform for a new kind of learning immersion? 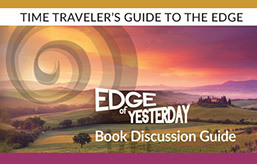 Edge of Yesterday Media (EOY Media) is a digital, interactive platform for transdisciplinary learning based on a teen time-travel novel, Edge of Yesterday. What if a runaway science fair scheme and your parents' smart device suddenly gave you the power to bend time? Our Mission: to use narrative-based learning to inspire, involve, and engage teens to face and overcome life's challenges. What we aim to accomplish: Re-Vision learning to prepare young people to solve 21st-century problems with the skills and knowledge needed to succeed in a rapidly changing world. By integrating learning across disciplines and new research on the science of character, we can prepare kids for 21st-century success. Besides just knowing the facts, thriving in our world requires problem solving, collaboration resilience, creativity, and inspiration for lifelong learning. What is narrative-based learning? Edge of Yesterday and EOY Media provide a discovery-based, interactive narrative experience for children and young teens that engages learning through story. What's Edge of Yesterday got to do with it? Edge of Yesterday and EOY Media use multimedia storytelling to cultivate creativity, curiosity, and character identification to inspire our children to follow their dreams. Science, humanities, technology, engineering, and math (SHTEAM) learning is the foundation.